The price to become one of Utah’s Top 25 individual political donors reached lofty heights this election cycle: nearly $100,000 each in contributions. Cracking the Top 10 required nearby double that: about $200,000 each. The No. 1 donor — Dave Bateman, an ultraconservative Republican who is co-founder of Entrata software company — contributed a titanic $777,454, a quarter-million dollars more than No. 2 donor Gail Miller, owner of the Utah Jazz. That is according to analysis by The Salt Lake Tribune of federal and state disclosure forms for donations to candidates, parties, political action committees and political issue committees (the groups that fund ballot initiatives) filed through July 31. Of course, the election season is ongoing and ends with the general election on Nov. 6 — so amounts could still rise. But the early tally helps show who is spending the most to influence politics so far. The list is top heavy with developers and business executives, sprinkled with some gay rights activists and even a former governor. Most don’t want to talk about their big donations. Among the top nine donors, only one granted an interview and three others provided some written statements about their donations. This two-year cycle, the top donors especially poured money into ballot initiatives — spending half their combined total directly on these causes rather than on candidates, parties or PACs. Three initiatives qualified for the ballot amid such spending: legalizing medical marijuana, fully expanding Medicare and creating an independent commission to redraw Utah’s political boundaries. One initiative that fell short — Count My Vote — attracted some of the biggest donations, both for and against it. That initiative sought to protect a legally challenged new law, SB54, which allows candidates to qualify for the ballot by collecting signatures and/or through the traditional caucus-convention system. Right-wing Republicans seek to revoke SB54, saying it allows “Republicans-in-name-only” to win the party nomination. Bateman, the No. 1 donor, used nearly all his donations to fight SB54, including big spending to save the Utah Republican Party from bankruptcy on the condition that it continue lawsuits challenging the new law, and vowing to take the fight all the way to the U.S. Supreme Court. On the other side of that battle, big donors trying to pass Count My Vote were more moderate co-chairs of the effort: Jazz owner Miller, giving $285,000, and former Gov. Mike Leavitt, who kicked in $250,000. Developer Kem C. Gardner, No. 3 on the list of top donors and a Democrat, contributed $200,000 to Count My Vote. Following is a look at the top 10 spending individual donors. Bateman and his money are the force that blocked Count My Vote from the ballot this year, and are behind continuing GOP lawsuits that seek to restore exclusive power to party convention delegates to nominate candidates. 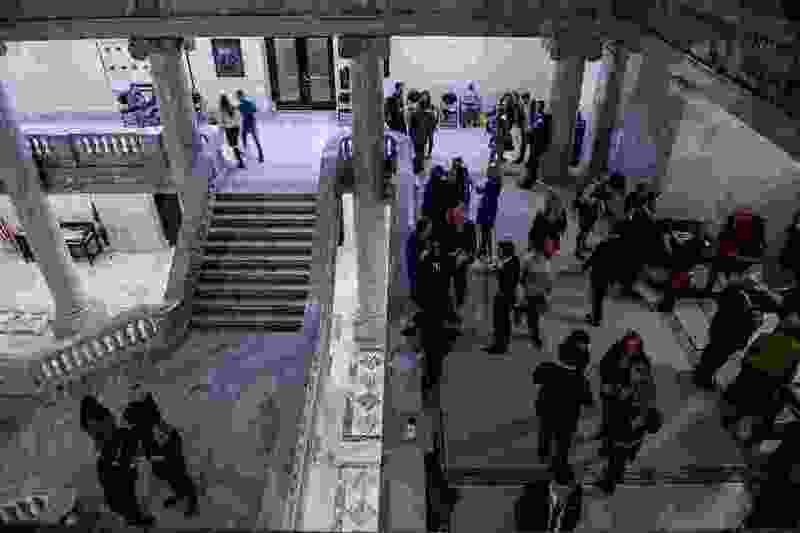 The Utah Republican Party faced legal bills of $410,000 for its lawsuits against SB54, which officials said threatened to bankrupt it. Bateman stepped in and “acquired the debt” from party lawyers — who settled for about 40 cents on the dollar — with some strings attached. 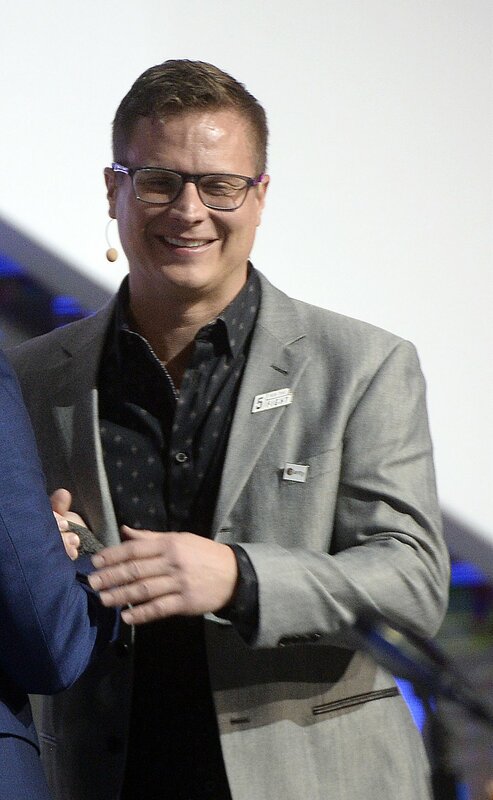 (Al Hartmann | The Salt Lake Tribune) Dave Bateman, Entrata CEO, speaks in the opening session of the 2018 Silicon Slopes Tech Summit at the Salt Lake Convention Center Thursday, Jan. 18. Bateman said he paid the lawyers $175,000 to settle their bills, and agreed to cover future costs of continuing legal battles against SB54. The catch is, the party would need to repay him if it ever chooses to drop those lawsuits without his permission or before all appeals (including to the U.S. Supreme Court) are exhausted. Meanwhile, forms show that Bateman and his Entrata also paid $482,582 to a group called Keep My Voice. It initially pushed an alternate initiative to Count My Vote, but failed to make much headway. Then it successfully managed to knock Count My Vote off the ballot by persuading just enough voters to withdraw their names from the initiative petition. Count My Vote is challenging that move in its own lawsuit now pending before the Utah Supreme Court. Bateman’s only donation to a federal candidate was $2,700 to conservative state Rep. Mike Kennedy, a convention-only U.S. Senate candidate who lost the Republican primary to former presidential candidate Mitt Romney. Bateman also landed in headlines this year by claiming that state Sen. Todd Weiler, R-Woods Cross, offered a woman $1 million to file false sexual harassment claims against him — hoping to smear Batemans’s political efforts. Police investigated, and concluded that “no crime was committed” as Weiler said claims were false. 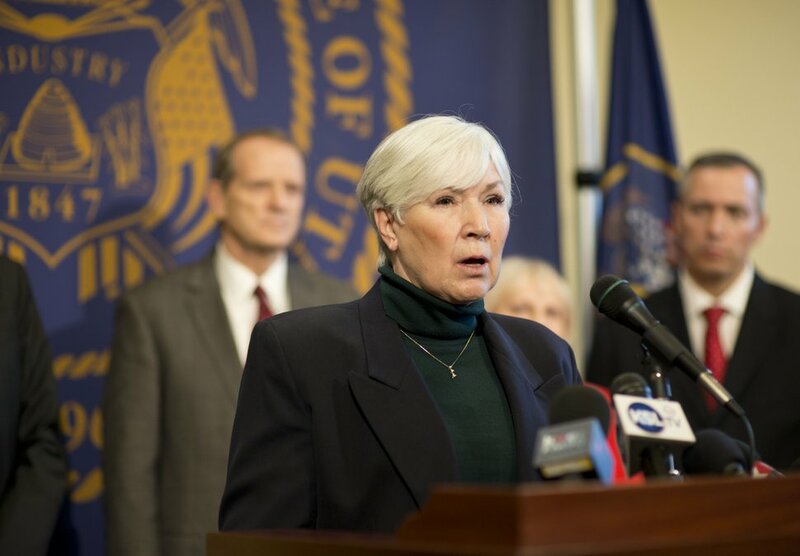 Miller, who chairs the Larry H. Miller companies, is one of the leaders of Count My Vote, the group on the opposite side of the political battle with Bateman. She gave that effort $285,000 and another $200,000 to the Our Schools Now ballot initiative, which sought to raise taxes to fund schools. The initiative disbanded after a compromise was reached in the Legislature for more education funding. Lennie Mahler | Tribune file photo Gail Miller speaks to reporters in a news conference announcing a deal between Count My Vote and lawmakers at the Capitol on Sunday, March 2, 2014. Miller donated both to Republicans and Democrats. Among the GOP candidates she supported were Romney (she gave him $8,100) and Rep. John Curtis ($2,500). Meanwhile, she gave $5,400 to Democratic Salt Lake County Mayor Ben McAdams, who is running against GOP Rep. Mia Love. She also gave $2,500 to the Utah State Democratic Committee, and $2,500 to the Salt Lake County Republican Party (but nothing to the Utah Republican Party that was pushing lawsuits against SB54). Miller’s companies said she was unavailable for comment because she was traveling, but provided a statement that they said she approved. “Gail strongly believes in this country, in free enterprise, and that each citizen has the responsibility to be involved in the democratic process. That involvement extends to supporting programs, policies and individuals who share her same visions and goals for government and our community,” it said. The developer gave $200,000 to Count My Vote and, through a family partnership, donated $100,000 to Our Schools Now. Most of the rest went to Democrats or Democratic causes. 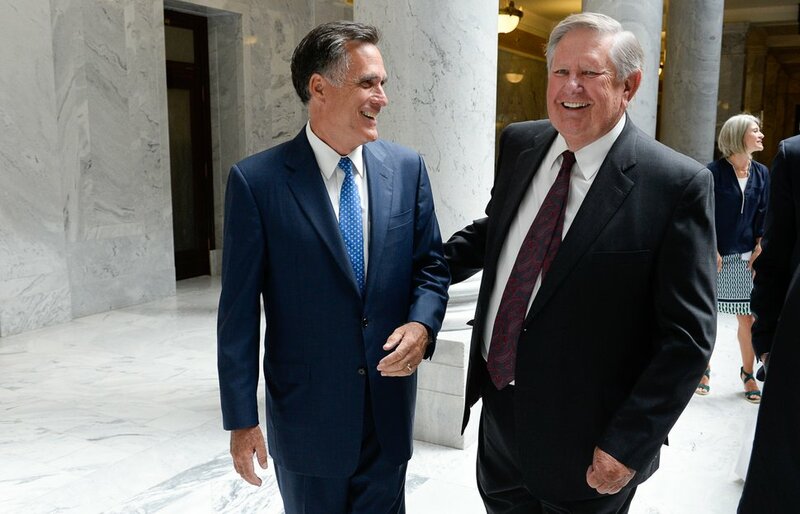 Francisco Kjolseth | The Salt Lake Tribune Former GOP presidential nominee Mitt Romney, left, shares a laugh at the Utah Capitol with businessman and philanthropist Kem Gardner, who made it possible through his donation to form the Kem C. Gardner Policy Institute at the University of Utah. The institute aims to gather thought leaders to help develop public policy to better serve Utah. That included $25,000 to the Utah State Democratic Fund, $25,000 to a leadership PAC controlled by McAdams plus $5,400 directly to McAdams’ congressional campaign. He also donated to several Democratic candidates for the Legislature. But Gardner also donated to two Republicans: $8,100 to Romney, a personal friend, and $5,400 to Sen. Mike Crapo, R-Idaho. Assistants said Gardner was traveling and unavailable for comment for the story. The founder of Variance Ventures is a grandson of Dee Smith, who started the Smith’s Food chain, and has written, “I came into money the easy way, I inherited it.” He donated mostly to Democratic candidates and party arms. Smith wrote that he joined it in part, ironically, to help it work against the oversized influence that big donors have in politics. The president and CEO of Keller Investment Properties donated at least $297,000 and his wife, Karen, is also No. 11 on list of Utah’s top donors, contributing at least $180,000. Keller Investment Properties is described as one of the largest private apartment companies in the West. “I do my best to give back to candidates that I believe reflect my values. Admittedly, I enjoy the networking and sociality, for the purest of reasons and expect nothing back in return. No quid quo pro,” Keller wrote in an email. 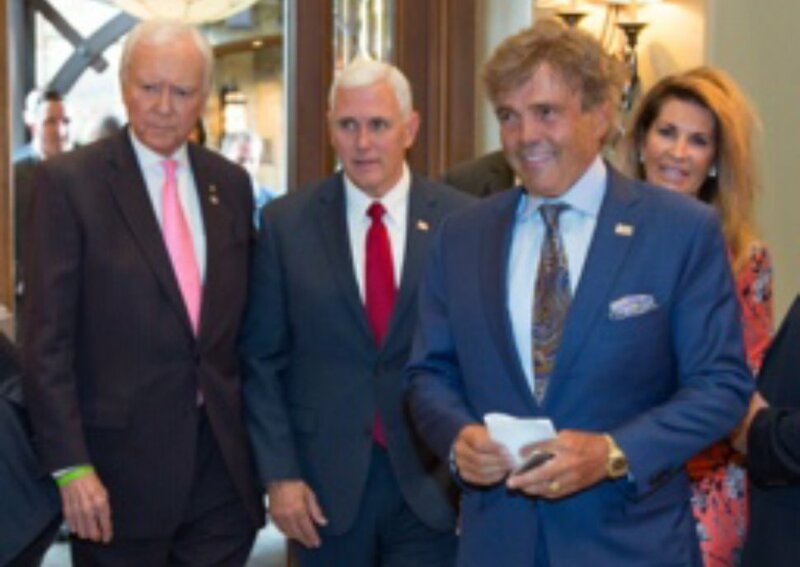 (photo courtesy of Scott Keller) Utahn Scott Keller, shown with Sen. Orrin Hatch and Vice President Mike Pence, is one of Utah's largest individual political donors. He donated $60,000 to the Utah Republican Party, and at least $76,900 to arms of the national GOP. He also gave $50,000 to U.S. House Speaker Paul Ryan’s leadership PAC. Keller also is a fan of Vice President Mike Pence, donating $5,000 to Pence’s Great America Committee PAC and $8,300 to the Indiana congressional campaign of the vice president’s brother, Greg Pence. The former three-term GOP governor was also a member of President George W. Bush’s Cabinet as both secretary of Health and Human Services and administrator of the Environmental Protection Agency. All of the $250,000 he has donated went to Count My Vote, where he is a co-chairman and a lead proponent. Associated Press file photo Former Health and Human Services Secretary Mike Leavitt participates in a news conference in September 2013 near the steps of the Utah State Capitol in Salt Lake City. Among the top nine donors, he was the only one to grant an interview about his contributions — which totaled at least $245,788 so far. 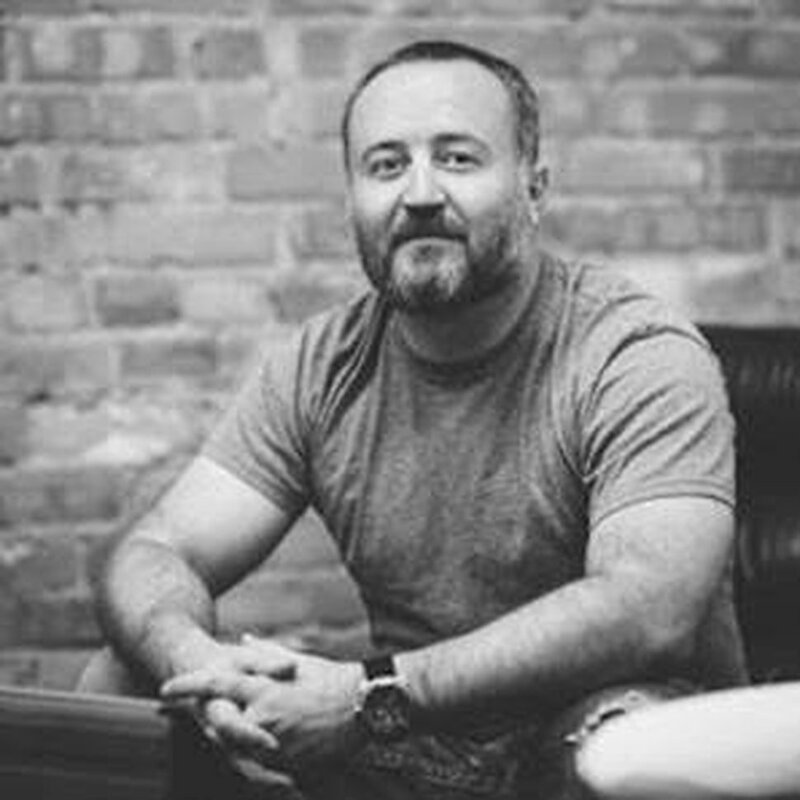 He is a gay rights activist, and was co-founder of WordPerfect. 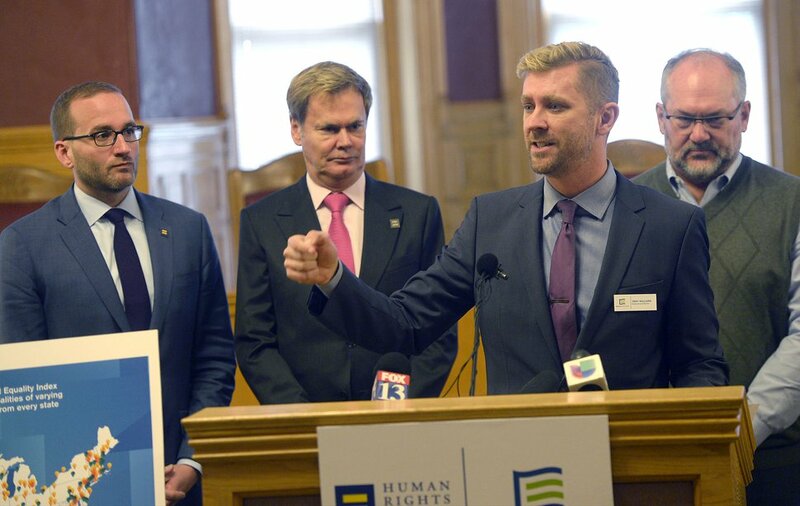 Al Hartmann | Tribune file photo Equality Utah's Troy Williams is joined by Chad Griffin, left, of Human Rights Campaign, Bruce Bastian, of Equality Utah and Salt Lake City Councilman Stan Penfold as he speaks at the City-County Building in October. That included giving $55,000 to the Better Boundaries ballot initiative seeking to have an independent commission redraw proposed political boundaries. “It could help stop gerrymandering,” Bastian says. “As a Democrat, I vote in every election. But being a resident of [heavily GOP] Orem, my vote is basically worthless. A lot of Democrats don’t vote because they feel the same way. He gave $19,000 to gay-rights PACs. But that’s nothing compared to the $1 million he once gave to fight Proposition 8 in California, which sought to block gay marriage there. The chairman of sPower and former CEO of EnergySolutions, who did not respond to requests for comment, donated at least $214,800. All of his donations — except $5,000 to a solar energy PAC — went to Republicans. That included $84,600 to the National Republican Congressional Committee, which helps elect Republicans to the U.S. House. He gave another $100,000 to Team Ryan, a leadership PAC of House Speaker Ryan, plus $10,000 to another Ryan PAC called Prosperity Action. The 2016 Utah Democratic gubernatorial nominee, who retired as CEO of CHG Medical Staffing, directed the bulk of his donations — $200,000 — to the Better Boundaries initiative to create an independent commission to draw political voting districts. 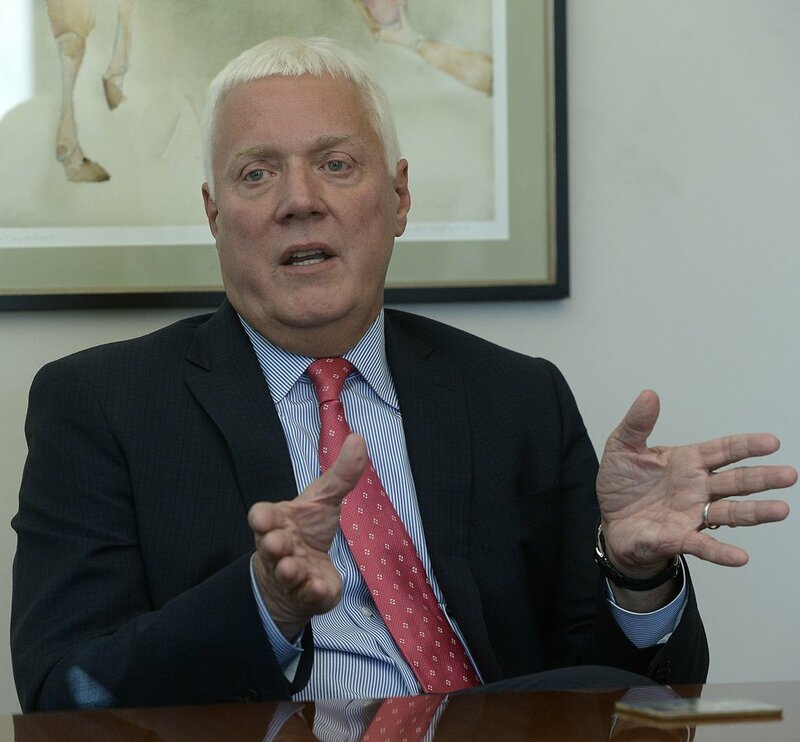 Al Hartmann | Tribune file photo Utah Democratic candidate for governor Michael Weinholtz meets with Salt Lake Tribune editorial board in September. The other $12,500 went to the Utah Democratic Party. He also did not respond to a request for comment. The Chairman of Peterson Partners financial planning gave virtually of his donations to Republican candidates and PACs. While this analysis focused on individual donors, money affecting Utah politics comes from many other sources, too. That includes donations from out-of-state groups to local causes. The largest among them so fair is The Fairness Project of Washington, D.C., which donated a huge $2.1 million this cycle to the ballot initiative seeking to expand Medicaid coverage for the poor. That group says it seeks to help working families by expanding Medicaid or increasing the minimum wage. Another large out of state donor is Action Now, based in Houston, which gave $355,000 to the Better Boundaries initiative. Besides Utah individuals and outside groups, Utah PACs, PICs and corporations also give plenty of political money. The biggest donor among them so far this cycle is the Utah Association of Realtors, which gave $435,726 — nearly triple the $148,300 donated by The Libertas Institute, which finished in second place among Utah groups (because of its donations to the medical marijuana ballot initiative). Earlier this year, Dave Robison, chairman of the Utah Association of Realtors’ PAC, described how his group chooses candidates to support. “We focus on honest and ethical policymakers who also support homeownership, affordable housing, small businesses and free enterprise,” he said. Robison noted it gives to people of any party who support such goals. Of note, at least five state legislators are current or former Realtors or real estate brokers, including Senate President Niederhauser, R-Sandy. Gov. Gary Herbert is also a former Realtor. Karen Keller, $180,960; Zions Bank President Scott Anderson, $175,134; Vivint President Alex Dunn, $174,300; attorney Walter J. Plumb III, $171,200 (mostly to the anti-medical marijuana fight); Phillip Purcell of Continental Investors, $170,500; and Jane Marquardt, vice president of Management and Training Corp. and a gay-rights activist, $161,162. Also, Eric Kamerath, $158,450; Dell Loy Hansen, a developer and owner of the Real Salt Lake soccer team, $146,200; Trolley Square owner Khosrow Semnani, $142,450; activist Deb Sawyer, $140,000; restauranteur Justine Miner, $137,000; John R. Miller, $115,500; Thanksgiving Point founder Alan Ashton, $110,000; Ocean Star International President Simon Soul-Sun Goe, $106,900; and Zions Bank chairman Harris Simmons, $95,650.